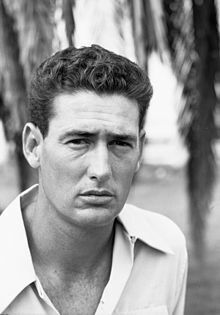 Ted Williams is the all-time Major League Baseball leader in on-base percentage. In baseball statistics, on-base percentage (OBP; sometimes referred to as on-base average/OBA, as the statistic is rarely presented as a true percentage) is a statistic generally measuring how frequently a batter reaches base. Specifically, it records the ratio of the batter's times-on-base (TOB) (the sum of hits, walks, and times hit by pitch) to their number of at bats. It first became an official MLB statistic in 1984. By factoring in only hits, walks and times hit by pitch, OBP does not credit the batter for reaching base due to fielding errors or decisions, as it does not increase when the batter reaches base due to fielding error, fielder's choice, dropped/uncaught third strike, fielder's obstruction, or catcher's interference. On-base percentage is added to slugging average to determine on-base plus slugging (OPS). The on-base percentage of all batters faced by one pitcher or team is referred to as on-base against. Traditionally, players with the best on-base percentages bat as leadoff hitter, unless they are power hitters, who traditionally bat slightly lower in the batting order. The league average for on-base percentage in Major League Baseball has varied considerably over time; at its peak in the late 1990s, it was around .340, whereas it was typically .300 during the dead-ball era. On-base percentage can also vary quite considerably from player to player. The record for the highest career OBP by a hitter, based on over 3000 plate appearances, is .482 by Ted Williams. The lowest is by Bill Bergen, who had an OBP of .194. In certain unofficial calculations, the denominator is simplified and replaced by Plate Appearance (PA); however, the calculation PAs includes certain infrequent events that will slightly lower the calculated OBP (i.e. catcher's interference, and sacrifice bunts). Sacrifice bunts are excluded from consideration on the basis that they are usually imposed by the manager with the expectation that the batter will not reach base, and thus do not accurately reflect the batter's ability to reach base when attempting to do so. ^ a b c "Glossary / Standard Stats / On-base Percentage (OBP)". MLB.com. Retrieved 13 June 2018. ^ "Career Leaders for On Base Percentage". Sports Reference, Inc. Retrieved 2011-06-25. ^ "Single Season League Leaders for On-Base Percentage". Sports Reference, Inc. Retrieved 2011-06-25.